The concept of submitting a website for review has roots in the world of print publishing, where authors (particularly of scholarly works) submit their works for peer review prior to publication. In this manner, works can be vetted before being read by a wider audience. This "SUBMIT" button and arrow cursor exemplify the submittal of a web site for editorial review. In like manner, web site authors may submit their works for review, typically by web directory editors or automated search engine spiders, prior to their inclusion in web directories or search engine indices where they may be found by a wider online audience. The varied editorial standards and perspectives of these human and automated reviewers tend to foster a democratic information society; good quality web sites are likely to be included in relevant directory categories and highly placed in search results, while poor quality web sites are rejected or poorly placed. A wide range of general interest, special interest, and regional directories directories is available on the web. Most of these web directories accept free or paid web site submissions, which are then reviewed by an editor and placed in an appropriate category. For the web site publisher, directory submissions offer a legitimate form of online public relations. Besides providing human-reviewed links and references to a web site, which the search engines may recognize favorably, they also provide direct sources of web site traffic. Some web directories start with a simple category structure and add categories as their top level categories become populated. Other web directories start with a comprehensive category structure and populate their category pages gradually as URLs are submitted. 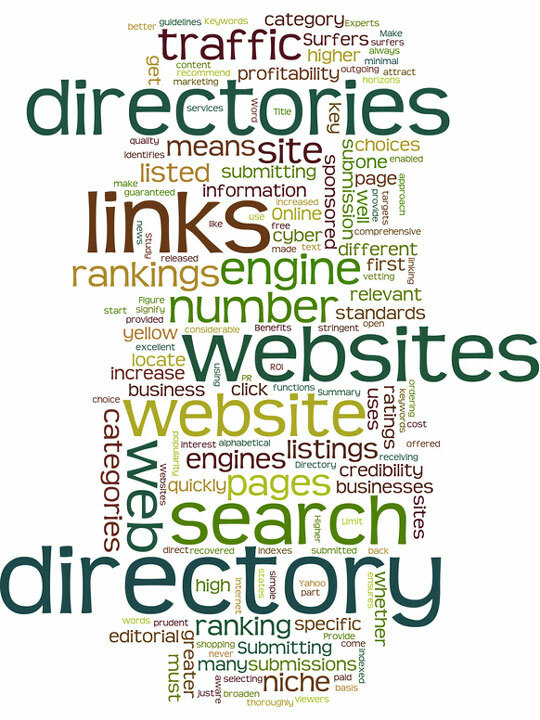 This directory links tag cloud depicts terms that relate to web site directory submissions. Web directories may feature regional categories – for continents, countries, states, cities, and/or islands. These regions may be distinct from topical categories, or their structure may be integrated with the topics in some manner. We have reviewed a sampling of general interest web directories that offer human-reviewed web site submissions; and we have found that these directories offer reasonable value and acceptable customer service. The Alexa links in this table feature thumbnails, brief descriptions, traffic ranks, contact info (if available), and site reviews. Google - add your URL to Google. Bing - submit your website to Bing. Internet Web Hosting - web site hosting services and solutions. Web Site Advertising - promoting, and placing ads on, web sites. Web Site Evaluations - web site design and evaluation services. Web Directory Reviews - web site directory ratings and reviews.